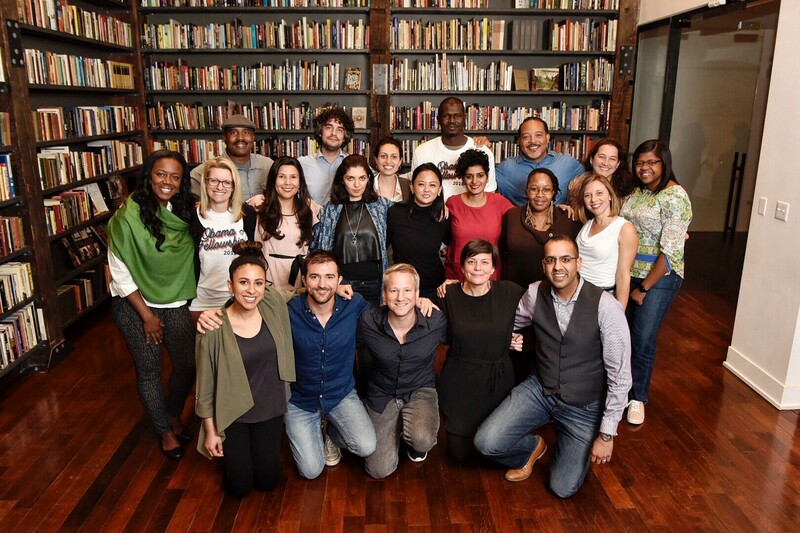 Three weeks ago, I joined the first gathering of Obama Foundation Fellows. We are 20 people from 11 countries around the world, working to improve our communities — from the US to the UK, India to Illinois, El Salvador to East Africa. We were selected from an inspiring 20,000 applicants — showing that at a time when many of us feel our world is coming apart, the hunger to come together is real: there are so many people doing such amazing things in their home communities. When I arrived at the gathering in Chicago, I wondered what it was that the Foundation had seen in the 20 of us — what we had in common and what, through the course of our two-year Fellowship, would help us to blend into more than the sum of our parts. By the next morning, I’d understood that we all share common values and common approaches to our work: a sense that people in places have agency; that authentic language is fundamental to how people relate; that action is urgent but change takes time and perseverance; that leadership is collective; and that while the Fellows have all sought to do something meaningful, we each have doubts and questions about our work. In the days since, all of us have been asked what we learned from our experience. I learned so much that can’t be crammed into a short blog post but that I hope, in time, will be expressed in the next stages of our work through The Cares Family. But I also learned much that — in the spirit of the Fellowship and the Obama Foundation’s mission to ‘inspire and empower people to change their world’ — is sharable right away, and that may be helpful to others as they carry out their own work. That notion — that change often comes tough and slow — was a theme of the week. On our first day together, we studied the ‘200-year present’: the notion that there are people alive today who were alive 100 years ago, and there are people here today who will be alive another 100 years from now — and that in the course of that 200 year span the world will transform many, many times. That may make us feel insignificant; equally, it can give us hope that at a time of division the future remains in our hands, still within our power to shape. The Obama Foundation is built with that philosophy and for that purpose. Its goals are to galvanise, mobilise, train and connect thousands of people all over the world to continue the work of creating change in their communities. President Obama has always known that his time in the White House would be short, but that a post-presidency can be long and its impact enduring. And there are millions of people who can be motivated to take up the mic and the mantle. That long process, of course, can feel attritional. I’ve written about the challenges of scaling, of building and sustaining a team, of the strain of growth. And in my week in Chicago I learned much about the tools and tactics required to stay healthy and to keep your eyes on the long game. I learned that in that long view, and in that attrition, self-care is key. In social change burnout happens because too many are too eager to be ‘nice’ and, in a bid to be so, we too often fail to set boundaries or to be clear about our intentions. Brené Brown, who led a session for the Fellows on the importance of vulnerability as a pathway to courage, said it many times: clarity is kind. To lead a team or achieve change, you’ve got to be open, available and have radical candour. And throughout the week, I was reminded of the importance of good sleep, good rest, and planning and controlling your time so that you can maximise your effectiveness. It sounds obvious. But it’s something that I and so many others, in the day-to-day, too often forget. I also learned more about the unique power of stories to emote and to motivate. I’ve spent a lot of time over the past eight years telling my own story — of how an 84-year-old man inspired North London Cares, South London Cares and Manchester Cares. But I never really understood why that story was effective until now: because it combines the personal with the problem, the political. It captures love and loss, hope and heartbreak, mischief and misadventure. While it’s unique, it’s also universal. From the other Fellows, I heard so many wonderful stories. Kalani Leifer told us that he’d spent his last day as a history teacher telling young people that their decisions mattered — but soon realised that what mattered more in our networked world, for better and for worse, was relationships. He’s spent the last four years building an organisation, COOP, that enables and supports young people to have stronger peer connections. Preethi Herman told me that through her work she learned that while men more frequently engaged in local campaigns, those led by women were statistically shown to be far more effective. So Preethi is building She Creates Change to train women in storytelling, advocacy and strategy — so that women all over the world can maximise their impact on what matters to them. I’ve occasionally been dismissive of the role of strategy — preferring to bootstrap an idea by scrapping around for whatever help and resource I can find. But at the gathering I learned that while advocacy, coalition building, communications and even legislation are important they cannot alone lead to systems or culture change. To do that, you need to plan ahead, assess the context, develop a process and be agnostic about how people who you need to be on board see the world. All of this reminded me of something I already felt: that community change is hard. But I left Chicago with a sense of optimism like I’ve never felt before because, while there is division and prejudice in our world and our communities, there are so many good people working, in their little ripples, to make change for the long term — that while the arc of the moral universe is long, with our eyes on the horizon, we can all do something to ensure it bends toward justice. Founder/CEO, @ManchesterCares, @SouthLDNCares, @NorthLDNCares. Ex-@Ed_Miliband aide & @LabourList editor. @ObamaFoundation Fellow.